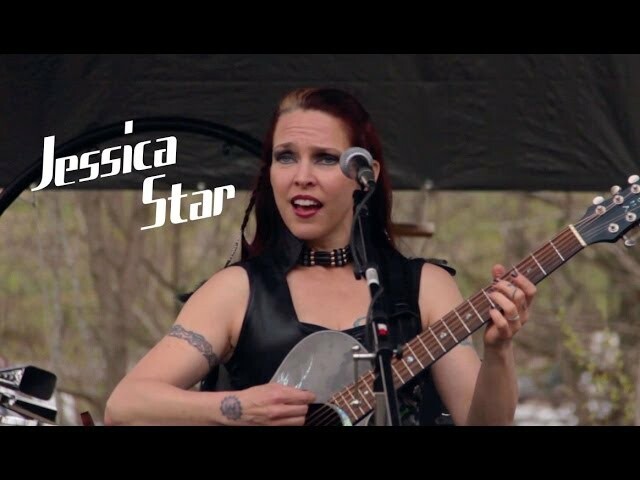 Jessica Star, the Fae Rock Songstress, and her band bring music to enchant the modern and soulful tribe of Earth. Drums, bass, cello and guitar weave with Jessica’s compelling vocals and original music to uplift the spirit. "RISING; From The Vault" to be uncaged this spring 2015! This was her first full length album of all her original songs recorded in 1995 at Fantasy Studios in Berkeley, California where she worked with producer, Bob Matthews (The Grateful Dead), and the late arranger, John Kahn (bassist of The Jerry Garcia Band). The musicians on this session include Mario Cippolina on bass (Huey Lewis and The News), Donny Baldwin on drums (Jefferson Starship), Pete Sears on the keyboard (Hot Tuna, Jefferson Starship, Moon Alice) and an orchestra of strings and horns. In 2014 Jessica released,"Mystical Creature". 13 personal songs produced by Winter, coproduced by Jessica Star, and featuring her bassist Joseph Blackfeather. The musicians on this album are Jessica Star on lead and harmony vocals and guitars, Joseph Blackfeather on five string bass guitar, Mark Abbott on drums, Winter on guitars, Gregg Tilles on guitar, Betsy Tinney on cello, Diana Rowan on harp, Kymberly Jackson on flute, Sharon Knight and Kellianna on harmony vocals and, Gary Haggerty on violin. "Solo" released in 2002 and recorded solo acoustic in Graton, CA features ten songs with Jessica singing and playing guitar, didgeridoo and clay flute. "Dragon's Lair" released in 1999 and recorded in top studios around the San Francisco Bay Area including Fantasy Studios, Laughing Tiger in San Rafael, and Prairie Sun in Cotati. This album features twelve original Star songs recorded solo acoustic, with her touring band and with legends of Rock. The 2013-2014 Jessica Star tour included FaerieWorlds in Eugene, Oregon, FaerieCon East in PA, Spoutwood Fairie Festival in PA, The Maryland Faerie Festival, The New York Faerie Festival, Wicked Faire, and The New Deal Café in MD. She has played several venues in NYC with her band including B.B. King's, the Knitting Factory, and the legendary Bitter End. Some of her Northern California venues include The Maritime Hall in San Francisco and The Harmony Festival and Luther Burbank Center in Santa Rosa. She’s performed at Burning Man almost every year of the eleven she’s attended, and has played several times at both the NYC and San Francisco Burning Man Decompression Parties. When asked why she plays music and what inspires her she says,"Some people have a choice whether to play music or not; luckily, I don’t. I’ve been following my musical path for a long time now and my life is rich and colorful because of it! I hope you love my songs and the instrumentation. This is my life's work. These are my stories and this is the sharing I bring to you from my soul."